Around half of the world’s population snores. 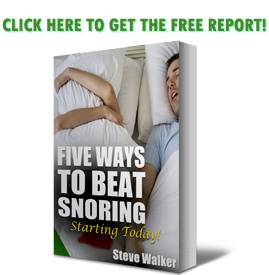 In reality, not all habitual snorers have an underlying condition like sleep apnea that is responsible for their loud snoring. Unfortunately, most, if not all, sleep apnea sufferers snore in their sleep. The snoring in itself is a major distraction to sleeping especially to your partner and it can cause disagreements that sometimes lead to having separate sleeping arrangements or even break up for real and for good. Meanwhile, many fail to realize how deadly this condition is considering a person literally stops breathing for a few seconds when they are asleep and it happens countless times all through the night. When you snore, you are more likely to suffer from sleep deprivation and poor sleep quality that leads to daytime fatigue. As a result, you become accident-prone and unable to focus on your tasks especially the ones requiring your utmost attention and concentration. The best way to overcome snoring and protect yourself from its many dangers is to understand why snoring happens in the first place. The vibrating sound we all know as snoring is actually the sound the air makes when passing a constricted airway in your slumber. By now, you are already aware that it has no cure but there are different alternatives to managing it and keeping the snoring at bay. Not every snorer sounds the same – there’s the freight train impersonator, pneumatic drill, and wounded walrus to name but three – and it turns out that people snore for a variety of reasons. So why do some of us snore and not others? ‘When we are awake, we have enough muscle tone to keep our airway open,’ says Consultant ENT Surgeon Michael Oko. ‘But when we sleep, we lose muscle tone and the tongue, throat and roof of the mouth relax, causing the loose tissue in the throat to sag, which narrows the airways. Your weight has a lot to do with why you snore because the neck tissues are filled with fats making breathing even harder when you are sleeping but it is mainly due to a congenital anomaly with the structure of your mouth or your nasal tract wherein the tongue mainly ends up always covering your airway when you are already sleeping and lose control of all voluntary muscles. Fortunately, you need not suffer anymore because there are plenty of remedies you can try to curb snoring and improve the quantity and quality of your sleep. CPAP is often the main choice for treatment because it ensures your body does not run out of life-giving oxygen every single night but it is quite uncomfortable to use. If you aren’t comfortable using it, you can explore over-the-counter devices like oral mouthpieces that may be not as effective as CPAP but still works in stopping snoring, examples of which are https://snoringmouthpiecereview.org/zquiet and https://snoringmouthpiecereview.org/sleeptight. The VitalSleep mouthpiece is definitely #justlittlesnoringthings material. It may not look glamorous, but it’s FDA-approved to reduce snoring by helping to keep your mouth slightly open, and therefore your airway open, while you sleep. Not all snoring solutions are glamorous, but they are all unique. And though #snoringaesthetic and #justlittlesnoring things probably aren’t going to become Insta’s top hashtags, those of us who use ’em will know we’re in good — if occasionally loud — company. You need not suffer from the discomforts or risks of snoring when there are solutions you can try. Some don’t even require you to spend money at all, such as tongue exercises that help improve the tongue’s muscle tone so that it does not relaxes and falls to the back of the throat when sleeping, thereby covering the airway and leading to the loud snoring sounds most people are annoyed with. If you are not a fan of oral devices, you can try other options like special mattresses, pillows, and even apps that work one way or the other in putting a stop to your snoring. You’ll soon find yourself sleeping soundly at night without the annoying noise that your partner will also be thankful for.